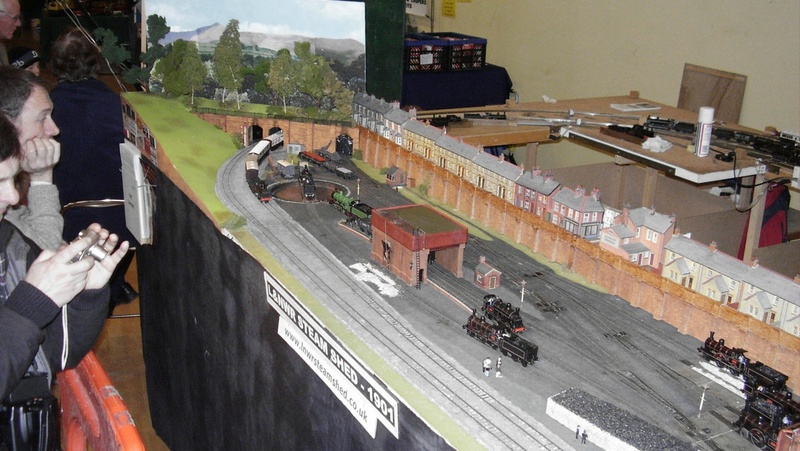 The setting for my layout is rather odd - it is set in a man-made hole in the ground! The steam shed is well below street level and is bounded on three sides by high retaining walls. Trainspotters would have had a magnificent view of all that was going on! There is, however, a precedent for such a setting. 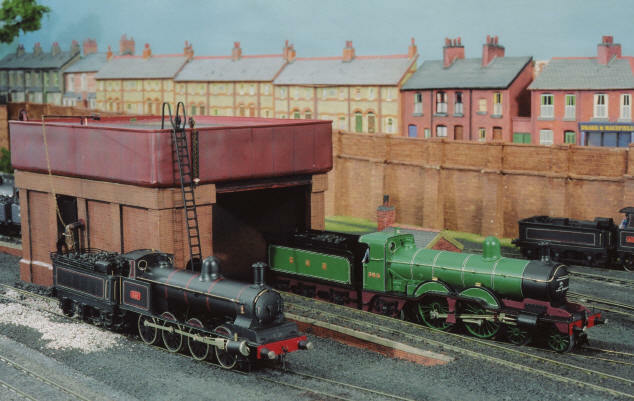 The late Jack Nelson, in his magnificent book 'LNWR Portrayed', illustrates on pages 70 and 71 the small steam shed that once existed at Lime Street Station, Liverpool, and which was set in a corner beneath high walls of natural rock. That was where I got my idea from, but my walls are of stonework and not rock. The wall at the rear of my steam shed dips down towards the centre, as did the one at Liverpool, and this makes it less monotonous. It did, however, cause a lot of extra work due to every buttress being of a different height. 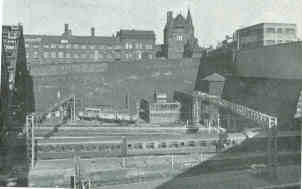 On top of this wall are rows of houses, a shop and a pub, some facing the railway and some backing on to it. This arrangement allowed me to cut the kits, from which the buildings are made, lengthwise down the middle and so get two buildings for the price of one. 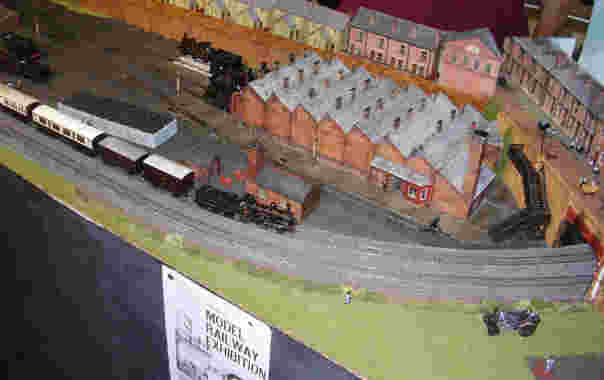 The wall to the right of the steam shed has a road immediately behind it with houses, a pub and a factory on the other side. The road spans the railway by means of a plate girder bridge just as the illustration in Jack Nelson's book. A mirror placed at the far end of the street creates the illusion that it is twice as long as it actually is. The wall to the left is backed by a grassy, tree-covered, hillside with a view of open hill country behind. This retaining wall is pierced by three tunnels. 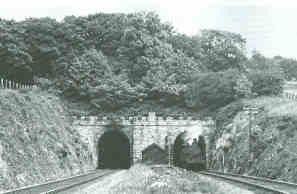 The rearward one is the exit and entry line to the steam shed, whilst the main line passes under the hills in a twin-bore tunnel. This feature was modelled on Vaynol Tunnel on the line between Bangor and Caernarvon, although mine has a less elaborate portal. The main line runs very close to the front edge of the baseboards before curving inwards at each end, which left me with two triangular areas to fill in. The left hand area is a simple grass-covered hillside, but I wanted a more interesting feature at the right-hand side. I seriously considered an allotment garden until it was pointed out to me that allotments did not exist in 1901. I then spotted a kit for a steam ploughing scene and that now fills the space and creates a lot of interest. The steam shed site itself contains a four-road shed built for me by my friend and fellow club member Alan Gray, from two Prototype kits. 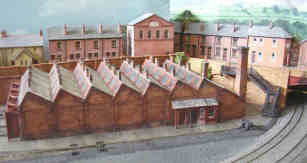 The surplus parts from these kits were sufficient to provide a factory frontage and a boilersmith's/blacksmith's workshop. There are numerous huts and cabins around the site but the other major structure is the coaling stage/water tower. This I built from scratch, using MDF and brick paper, from the drawings in Jack Nelson's book. The water tank consists of a block of balsa wood clad in thin plasticard. The water is a piece of Perspex. I am not sure whether these tanks were completely covered with timber roofs or left open, so I have compromised and provided a timber walkway to give the plumber access to the valves and fittings. The basis of the turntable is a very substantial aluminium turned dish kindly given to me by Alan Gray. The deck is made from hardboard and plasticard and the spindle is a worn-out twist drill that just happened to be of the right diameter. 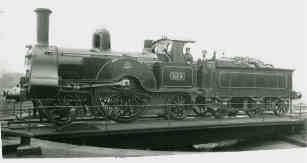 The turntable is turned by hand through a system of rods and an old 40/1 worm and wheel gear. 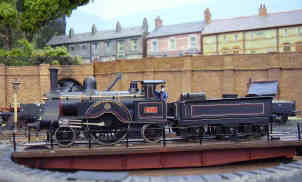 Unfortunately there is a bit of backlash in the system and every now and then it gives a twitch, usually when a loco is half way on or off the turntable. However, it does keep the operator awake! The scene is populated by horse drawn vehicles, handcarts and quite a lot of people. I like to set up little scenes. I have two officials examining where coal has been stolen from the whitewashed stack, whilst the thief makes his getaway behind a hedge. I also have a couple of arguments taking place in the roadway and a scene of a soldier in uniform walking with his wife who is pushing a pram. My dad is the baby in the pram!